One of our most popular interviews last year was with Tom Goodlet. As we look at our goals for 2018, mentorship remains critical to our success as leaders so I wanted to repeat this episode so that we can keep the lessons in mind as we plan for the year ahead. Mentorship is key to successful professional development and as leaders, we have the responsibility to offer ourselves as mentors to the next generation of business leaders. But what is involved in a mentor-mentee relationship and how do you go about finding a suitable individual to work with? 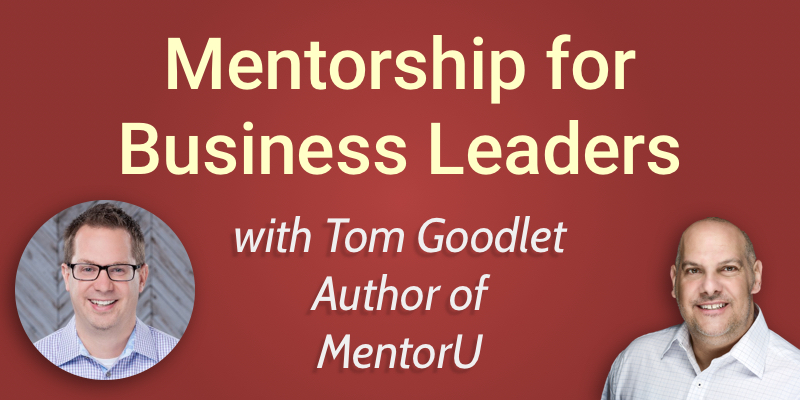 To answer these questions we spoke to Tom Goodlet, co-author of the book MentorU. How do you develop trust in following the guidance of a mentor? What is the responsibility of the mentee? There are many factors that go into defining our achievement. You should have a solid skill set and business expertise. One of the key ways you can develop this knowledge and these skills is by making mistakes. As we reflect on these mistakes we grow and know what to avoid in future. Making mistakes is a part of our growth. But another way that we gain the required expertise and grow professionally is by finding a mentor. Usually, there are two big failures in the business world. Firstly; the individuals don’t use and benefit from mentorship. But secondarily, the people that could be mentors aren’t stepping up to take that responsibility. Aligning yourself with a mentor will allow you the opportunity to learn from their knowledge. They can guide you in developing future opportunities in your career and business. So how do you best find a mentor? When you find a mentor, how do you know that they have your best interests in mind? How do you develop the trust in following your mentor’s guidance? In today’s show, we’re going to answer those questions and more. Today’s guest is Tom Goodlet – an Author of ‘MentorU’, Speaker and Associate Minister at Harborside Christian Church. Tom’s expertise is in the religious institutions industry. He is skilled in Theology, Leadership, Event Planning, Discipleship, Pastoral Counseling, Curriculum Development, Mentorship and Volunteer Management. For more information about him and his book MentorU checkout www.mentoru.info. Mentorship allows you to go deep and grow fast. There are great resources available through conferences, podcasts, blogs etc. but with mentorship, you hone in on the mentee and you can be laser-focused on their growth. It’s an efficient way to learn and grow because the topic is ‘you’. You get a sense of accountability. You have somebody to discuss mistakes made and learnings that come from business experience, dissect what has happened and learn from it. Being held accountable for your goals and actions keeps you focused on growth and the ability to analyze and reflect on mistakes helps you to learn. When I was in the military, I had a Chief Master Sergeant who was complaining about a process. For dramatic purposes he slams his hands on the table and says ‘Sergeant, I’ve tried that a hundred times and it doesn’t work.’ And I felt about 2 inches tall. Well it didn’t work the 101st time, but he didn’t stifle my creativity. And then after that process, we got to chat about it and he helped me reflect on what the challenge was. But I think that was a very valuable teaching moment for me. Mentorship is a safe place to look at and learn from mistakes. We learn more by doing and so you should not be afraid of failure. It’s not failure unless you give up. So long as you do dissect it and learn from it, it’s not actually a failure. Good mentors help you along, give you encouragement and see you through the dark time of mistakes to see the potential success that comes from learning experiences. We need that cheering section, that mentor by our side to help get us into the celebration part of the process. We have to be honest with ourselves going into mentorship. We know mentorship is beneficial for everybody, but not everybody is ready for mentorship. There are some requirements you want to meet – Tom uses the acronym ‘CLEAR’ to help you identify who your mentor should be. More on that below. It requires some resolve; some courage to take the step to commit to mentorship and the journey of working with your mentor to learn and grow. C: Connect – who do you naturally connect with? You don’t want to force a relationship with your mentor. You want to find a mentor that you are comfortable with and enjoy spending time with. L: Learn – who can you learn from? Or who can learn from me? E: Excited – who would you be excited to mentor you? You don’t want to have to manufacture excitement to work with a mentor. Find a mentor you are excited to work with. A: Authentic – you want to find a mentor who is not trying to be somebody they are not. Somebody who is not in denial of their weaknesses. Someone that knows their strengths. R: Reliability – you want to have a mentor that you can rely on to meet with you. The other point that Tom makes is around resolve. Fear is often the indicator that we’re on to something good – if you are nervous or it feels risky to ask somebody to be your mentor, you are probably on the right track. Like asking somebody out on a first date. If you can show the resolve to get past that fear, you’re likely to be setting up a relationship that gets you excited and motivated to make the most of mentorship. If your mentor gives you some advice that you can’t see the value in yet, it’s important to trust the guidance of your mentor. Tom suggests that time is the major factor. Mentorship is not something you should rush. You have to develop a relationship organically and not meet too frequently. Allow time to build trust with your mentor by meeting just every couple of weeks and allowing time to see the results of the advice given. Taking the time to get to know each other is essential to have an understanding and trusting mentor relationship. The nice thing about mentorship is that you have accountability both ways. As the mentee, you are responsible for being prepared for your mentorship meetings, ready to report how your career or business is developing. Your mentee is going to hold you accountable to actions, homework, follow-up. Another responsibility of the mentee is to bring questions. You have to be prepared to get the most out of the time you spend together, so coming with a list of questions to ask your mentor/mentee is important. Tom’s book is loaded with mentorship questions to help you in this. Tom co-wrote MentorU with his friend and mentee, Matt Gardner. It’s a universal first step for anybody who wants to start mentoring that leads to the individual’s next step because everybody’s next step is going to be different. Through the book, you build towards a strategic growth plan for the individual being mentored. If you’re being a mentor, you’re always fed more when you’re feeding. Every time Tom has mentored somebody else, he has grown immensely. Mentoring delivers value both ways. The book provides expert guidance on conducting a productive mentor-mentee relationship. You can find MentorU on Amazon. You can connect with Tom on LinkedIn.